Delinquent on your home mortgage payments? You may be in luck. For borrowers whose loans are owned or guaranteed by Fannie Mae or Freddy Mac, the Federal Housing Finance Agency (or FHFA) will soon offer a Principal Reduction Modification Program to borrowers that meet certain eligibility requirements. The program was implemented with the goal to “maximize assistance for homeowners” and “minimize foreclosures.” (See Emergency Economic Stabilization Act of 2008). The modification will be available to “owner-occupant borrowers” who are 90 days or more delinquent as of March 1, 2016; whose mortgages have an outstanding unpaid principal balance of $250,000 or less; and whose mark-to-market loan-to-value ratio (MTMLTV) ratios exceed 115 percent after capitalization. Confused or intimidated? Don’t be. Essentially, the MTMLTV just measures how underwater you are with your home mortgage. It looks at how much a person owes on their mortgage relative to the fair market value of their home by taking the unpaid principal balance and dividing it by the property value. A ratio of 100% means that your home is worth the same as what you owe. So a ratio of 115% means that your home is worth more than what you still owe on it. 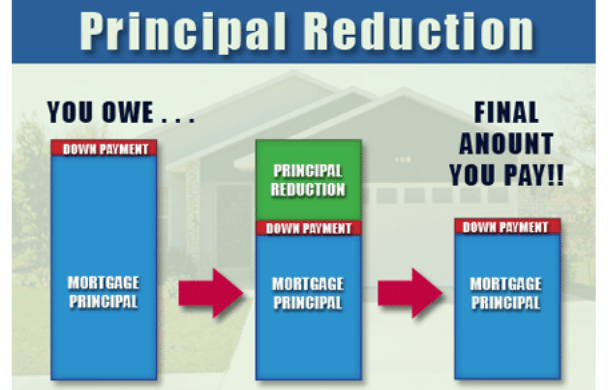 The FHFA estimates that approximately 33,000 borrowers will eligible for a Principal Reduction Modification. For eligible homeowners, mortgage service companies are required to solicit you for a Principal Reduction Modification if you are eligible. Mortgage loan servicers must solicit borrowers eligible for the program no later than October 15, 2016. Upon completion of three timely payments and acceptance of the final modification, the principal forbearance amount calculated under the Streamlined Modification will instead be forgiven. If you have received a solicitation letter from your mortgage servicer, it is very important that you call our office immediately. The modification program generally requires that eligible borrowers must make their first trial payment within the month following their month of solicitation. For eligible borrowers, no complex documentation regarding income or assets is required. After making three timely trial payments, fulfilling all requirements of the trial period plan, and executing and returning the final modification documents, those borrowers will have earned a principal reduction modification. Some servicers may take longer than others to solicit borrowers about whether they qualify for a principal reduction modification than others. If you believe you may qualify for the program but have not heard from your servicer or just need to act soon to get help and avoid foreclosure, another option is to participate in a Streamlined Modification. While this does not guarantee that you are eligible for principal reduction, it may be useful to halt foreclosure proceedings. We know mortgage and foreclosure issues can be overwhelming, but we are here to help. If you have any questions or concerns please do not hesitate to call our office. Thank you and have a great day!